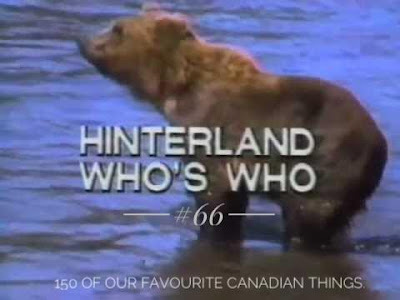 Thanks to Hinterland Who's Who, I know a bit about the animals that represent our country like the illustrious beaver, the renowned moose, the distinguished gannet and the famed loon all noble animals and all proudly Canadian. When you are out and about in nature and you see an animal and you don't try to copy the narrator from this series, you are not living life to its fullest. Give it a try next time you are out, it's great fun. Hinterland Who's Who is best known as a series of 60-second public service announcements paying homage to Canadian animals. The series was produced by Environment Canada Wildlife Service and the National Film Board of Canada in the 1960's and 70"s, and re-launched by the Canadian Wildlife Federation in the 2000's. While the word "hinterland" refers to an area near a coast line or river bank, the series explores wildlife throughout Canada, regardless of where they roam.